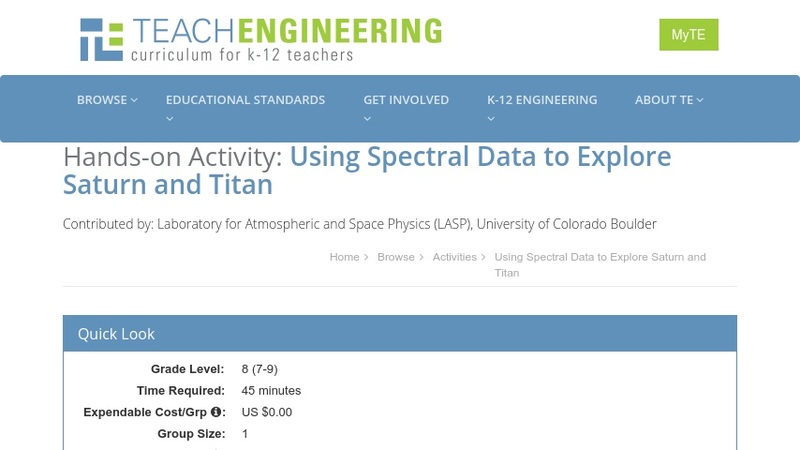 This lesson package for middle school integrates authentic spectral data from NASA's Cassini exploration of Saturn and its moon, Titan. Students will analyze known data from UV spectroscopes, then match the peaks and valleys to spectral images returned from Cassini. With careful comparison, they should be able to determine at least two elements present in Saturn's rings and on Titan. Lesson objectives include: 1) Match plots of new data to experimentally known data; 2) Gain a deeper understanding of the complex design that is required for spacecraft instrumentation and communications; 3) Compare/contrast chemical composition of Earth, Saturn, and Titan; 4) Understand that Saturn's moon, Titan, has an atmosphere which could contain building blocks that support life. The lesson contains worksheet with answer key, Power Point warm-up, and vocabulary lists. This resource is part of the TeachEngineering digital library, which provides teacher-tested lessons designed to connect real-world experiences with curricular content in the K-12 science/math classroom.